Believing prayer is a language that is spoken by the heart. Our strength in prayer is not developed by growing our eloquence, but by growing our faith. Jesus told us, "And when you pray, do not keep on babbling like pagans, for they think they will be heard because of their many words." (Matthew 6:7 NIV). The power of prayer is found in its simplicity, not its complexity or frequency. We should never think that God will not hear or answer our prayer unless we use just the right words, phrase them correctly, and repeat them frequently. Even if the words that we speak don't come out just right, God knows exactly what our heart is wanting to say. God doesn't need us to pray the "right words" so He can understand what our need is, and He doesn't need us to continue to repeat them so He won't forget our prayer. Jesus assures that God knows all about our need and knows how to meet it even before our prayer begins (Matthew 6:8). God hears and answers prayer based upon our relationship to Him. 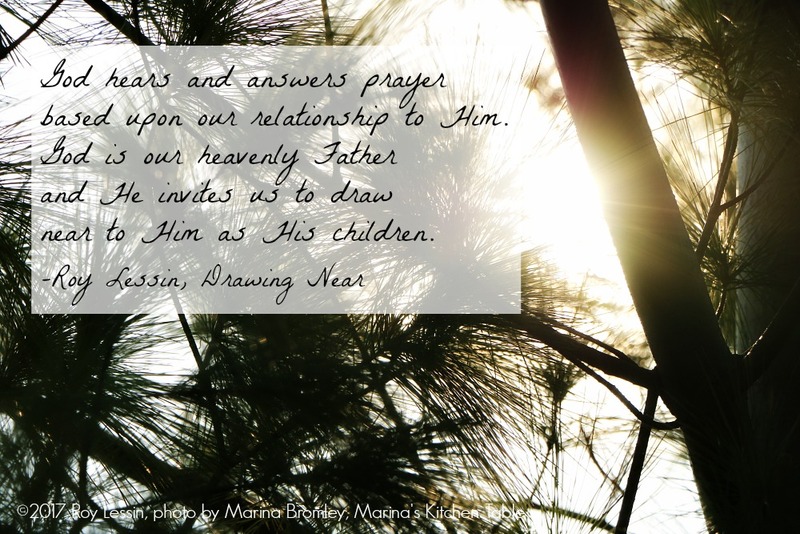 God is our heavenly Father and He invites us to draw near to Him as His children. From Drawing Near, Prayers Blessing, Promises ©2017 Roy Lessin Available at DaySpring.com and other Christian retailers. Used with permission.